Pain control, one of the central goals of hospice care, is a top priority in end-of-life care. The pain care plan must be flexible to respond to the constantly changing challenges of irreversible illness. The use of opioid medications is often crucial in alleviating physical discomfort including pain, fear, and dyspnea. Patient response to opioids is highly variable with medication selection and dosing based on patient goals, physical makeup, and ongoing pain assessments. In order to help a patient obtain the best possible quality of life, opioid doses must be carefully adjusted to ensure he or she is comfortable while balancing side effects and preventing loss of alertness. Although ER opioids provide more consistent levels and improved pain management, tolerance to analgesia can occur as with all opioid products. Patients should have an IR opioid available to be used as needed for breakthrough pain, which can occur due to end-of-dose failure where the concentration of the ER opioid falls below the required therapeutic concentration. Over time, dosage adjustments may need to be made. In some cases, the frequency of administration may need to be increased or an existing opioid may need to be changed to another opioid agent, a practice termed opioid switching. In addition to tolerance to analgesia, tolerance to opioid side effects also occurs, usually after several days, with the exception of constipation.5 Patients receiving routine opioids should be placed on an appropriate laxative regimen. • ER opioids are indicated only for the management of pain severe enough to require daily around-the-clock long-term opioid treatment and for which alternative treatment options are inadequate. • Serious, life-threatening, or fatal respiratory depression may occur even at recommended doses. • Oral ER formulations must be swallowed whole; crushing, chewing, or dissolving can cause rapid release and absorption of a potentially fatal dose. • Coingestion of alcohol (including alcohol in prescription and over-the-counter products) may increase opioid plasma levels and fatal overdose risk. • Overestimating the dose when converting patients from another opioid product to an ER product can result in fatal overdose. It is safer to underestimate the anticipated required dose and provide a breakthrough medication (eg, IR opioid). • Hypotension, profound sedation, coma, respiratory depression, and death may result if used with alcohol or other central nervous system depressants (eg, sedatives). • ER/LA opioids are not intended for "as-needed" pain management. Opioid tolerance occurs in patients taking at least 60 mg of oral morphine daily, 25 mcg of transdermal fentanyl per hour, 30 mg of oral oxycodone daily, 8 mg oral hydromorphone daily, or an equivalent total daily dose (TDD) of another opioid for at least one week. Opioid-naïve patients are those patients who are using opioid initially or who are not opioid tolerant. Morphine, a naturally occurring opioid, is the prototype for all pure mu-agonist opioids. ER morphine products are not interchangeable.9 Refer to product labeling when converting from one product to another. Additional information can be accessed at www.drugs.com/pro/morphine-extended-release-capsules.html. A once- or twice-daily morphine ER formulation (Kadian) uses time-release pellets and is also available in capsule form. Morphine ER tablets (MS Contin) are dosed every 12 hours but may be dosed every eight hours for patients whose pain is not fully controlled over the 12-hour release time. Elimination of morphine metabolites is dependent upon kidney function for clearance. Avoid or use with reduced dosing (decrease dose 50% to 75%) in patients with renal impairment or advanced liver disease due to prolonged half-life and risk of toxicity. Accumulation of M3G metabolite may contribute to hyperalgesia or other neurotoxic effects. Morphine ER capsules can be opened and sprinkled on applesauce and eaten immediately without chewing; do not crush, dissolve, or chew the beads, as doing so can result in a rapid release of a potentially fatal dose of morphine. Have patients rinse the mouth to ensure all spheres/pellets have been swallowed. Morphine ER tablets can be given rectally, if necessary. Oxycodone controlled release (Oxycodone ER, OxyContin) is a semisynthetic opioid and a pure opioid mu-agonist. Oxycodone ER and morphine ER appear to offer comparable analgesia; however, there appears to be some difference in their adverse effect profiles. Constipation and headaches appear to be more common with Oxycodone ER while hallucinations, vomiting, itching, and histamine release appear to be less common/less intense with Oxycodone ER compared with morphine ER. A typical initial dose is 10 mg every 12 hours.10 Decrease the dose by 33% to 50% in special patient populations (age >65 years, hepatic impaired, or renal impaired [CrCl <60 ml/min]) and in patients taking other central nervous system depressants. Oxycodone ER 60 mg and 80 mg strengths, a single dose >40 mg, or a TDD of >80 mg are for use only in opioid-tolerant patients. In conversion from other oral oxycodone formulations to oxycodone ER, initiate oxycodone ER with one-half the oral oxycodone TDD (mg/day) given every 12 hours. In conversion from other opioids to oxycodone ER, discontinue all other around-the-clock opioids and initiate with 10 mg every 12 hours. In conversion from transdermal fentanyl to oxycodone ER, for each 25 mcg/hour transdermal dose, substitute 10 mg oxycodone ER every 12 hours. Doses of oxycodone ER should be initiated 18 hours after the removal of the fentanyl patch. Doses may be adjusted every one to two days with the TDD increased by 25% to 50% and given in divided doses every 12 hours. Fentanyl patches should be used only in opioid-tolerant patients and should never be used in opioid-naïve patients. Discontinue or taper all other around-the-clock or ER opioids when initiating therapy with fentanyl transdermal patches. To convert patients from oral or parenteral opioids to a transdermal patch, calculate the TDD of opioid required, based on prior use. Using one of the widely available conversion tables, the initial fentanyl dosage may be approximated from the 24-hour morphine dosage equivalent (underestimating the 24-hour equivalent is safer than risking overestimation). Do not increase the dose more frequently than every three days after the initial dose or every six days thereafter. Dosage increases may be based on daily supplemental dosage required on the second or third day of application. Pain is controlled for the majority of patients with every 72 hours administration; however, a small number of patients require every 48 hours administration. When discontinuing, use a gradual downward titration (eg, decrease by 50% every six days) to reduce the possibility of withdrawal symptoms. For patients with mild to moderate impairment of renal or hepatic function, reduce the dose by 50%. If severe impairment exists, use is not recommended. Fentanyl patches are contraindicated in patients with severe respiratory disease or depression; those with paralytic ileus; and patients requiring short-term therapy or management of acute or intermittent, postoperative, or mild pain. Severe hypotension including orthostatic hypotension and syncope may occur in ambulatory patients. Remove used patches when a new one is applied. After 72 hours, approximately 40% of fentanyl remains in the patch. Proper storage of patches and disposal of used fentanyl patches is necessary to prevent accidental exposure/risk of death by others. Dosing of fentanyl patches may be confusing. The patch dosage form of Duragesic-12 actually delivers 12.5 mcg/hour of fentanyl. Use caution, as orders may be written as "Duragesic 12.5," which can be interpreted as a 125 mcg dose. — Mark D. Coggins, PharmD, CGP, FASCP, is vice president of pharmacy services for Diversicare, which operates skilled nursing centers in nine states, and is a director on the board of the American Society of Consultant Pharmacists. He was nationally recognized by the Commission for Certification in Geriatric Pharmacy with the 2010 Excellence in Geriatric Pharmacy Practice Award. 1. McCarberg BH, Barkin RL. Long-acting opioids for chronic pain; pharmacotherapeutic opportunities to enhance compliance, quality of life, and analgesia. Am J Ther. 2001;8(3):181-186. 2. American Pain Society. Principles of Analgesic Use in the Treatment of Acute Pain and Cancer Pain. 5th ed. Glenview, IL: American Pain Society; 2003. 3. Rauck RL. What is the case for prescribing long-acting opioids over short-acting opioids for patients with chronic pain? A critical review. Pain Pract. 2009;9(6):468-479. 4. Ferrell B, Wisdom C, Wenzl C, Brown J. 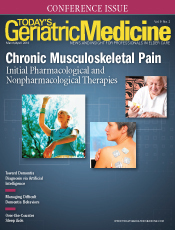 Effects of controlled-released morphine on quality of life for cancer pain. Oncol Nurs Forum. 1989;16(4):521-526. 5. Dumas EO, Pollack GM. Opioid tolerance development: a pharmacokinetic/pharmacodynamic perspective. AAPS J. 2008;10(4):537-551. 6. Questions and answers: FDA approves a risk evaluation and mitigation strategy (REMS) for extended-release and long-acting (ER/LA) opioid analgesics. US Food and Drug Administration website. http://www.fda.gov/Drugs/DrugSafety/InformationbyDrugClass/ucm309742.htm. Updated October 20, 2015. 7. Goal of label changes: better prescribing, safer use of opioids. US Food and Drug Administration website. http://www.fda.gov/ForConsumers/ConsumerUpdates/ucm367660.htm. Updated September 23, 2013. 8. Extended-release (ER) and long-acting (LA) opioid analgesc risk evaluation and mitigation strategy (REMS). US Food and Drug Administration website. http://www.accessdata.fda.gov/drugsatfda_docs/rems/ERLA_opioids_2015-08-13_REMS_full.pdf. Updated August 2015. 9. Morphine extended release capsules. Drugs.com website. http://www.drugs.com/pro/morphine-extended-release-capsules.html. Updated November 2015. 10. OxyContin. Drugs.com website. http://www.drugs.com/pro/oxycontin.html. Updated April 2014. 11. Duragesic. Drugs.com website. http://www.drugs.com/pro/duragesic.html. Updated August 2014.